Hellooooooo darlin’! Is this week going slow AF or what?! I just woke up thinking it was Friday and was rudely mistaken. It’s Wednesday. And I still have a lot to do by Saturday. And this rainy weather in Colorado is really cramping my style. Not only does Jackson not want to go on a walk…ok ok, I don’t want to go on a walk…but it’s very difficult to take a pretty food photo when it looks like it’s 7pm throughout the day. It got down to 63 degrees in our house yesterday and I had to finally give in and turn on the heat. I was really trying to wait until November. That obviously didn’t work. Guess what?! If you’re in the Denver area and interested in all things grain-free, well there is a super cool event coming up! The Great Grain Free Fair on Oct 8th! There will be tons of amazing vendors, companies and fun people! I’m even signing book with Bill and Hayley of Primal Palate that day! There will even be some fitness and yoga classes to try out! Come play! Can you believe that women in Saudi Arabia were JUST given the right to finally drive?? They still have a ton of rules like they can’t drive until they are 30, they need male permission and they can only drive at certain hours…but I guess it’s still a step in the right direction. I listened to this on the news this morning and it’s so surprising that this is still the case in some countries. It’s easy to forget about all of our opportunities and this definitely put things in perspective today. It’s pretty weird to imagine to not be able to step into my car and go wherever I please, whenever I please. So let’s send a quick cheers to women in Saudia Arabia! Congratulations and I hope this new opportunity opens up even more over time! You know what I was thinking about yesterday? How I care way more about what’s happening in the world vs. the bullsh*t I used to care about. It makes me feel old. I use to spend my free time watching The Kardashians and now I turn on the news instead. And now I’m spending my time thinking about politics. Gross. I hate politics and all things that surround it. Actually, forget all that, I’m still obsessed with The Bachelor. I still care about bullsh*t.
Speaking of bullsh*t, has anyone purchased the new iPhone 8 that costs 1 million dollars? I’m ready to update my phone, especially since it’s part of my job to be on my phone, but is it worth the money? Give me the deets! Preheat oven to broiler (55o degrees F). Line baking sheet with foil then place salmon filets on the baking sheet and sprinkle with salt. Cook bacon in a large pan until crispy, about 4 minutes per side. Set aside on a paper towel then chop into small pieces. Place salmon in oven under the broiler to cook for 6-8 minutes, depending on the thickness of the filet. This will cook the salmon to medium-rare and still flaky. 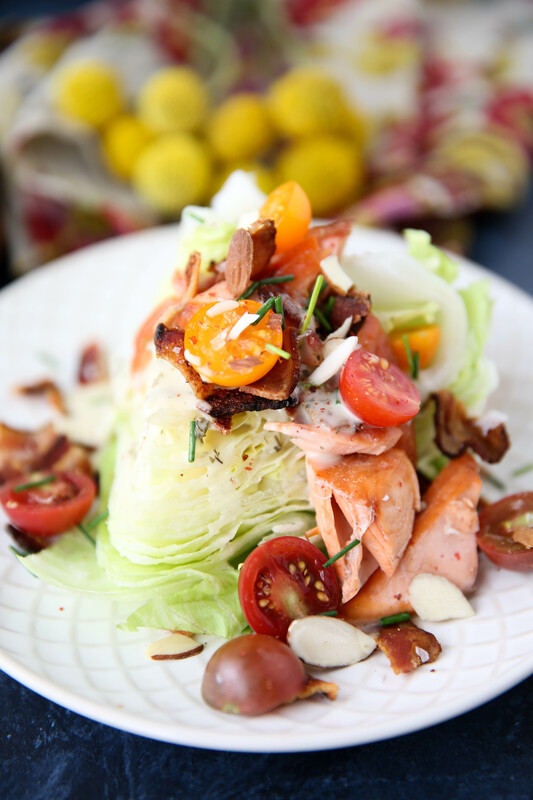 While the salmon cooks, discard the outer leaves of the lettuce and cut the iceberg in half right through the middle, then cut the halves in half once again to create four wedges. 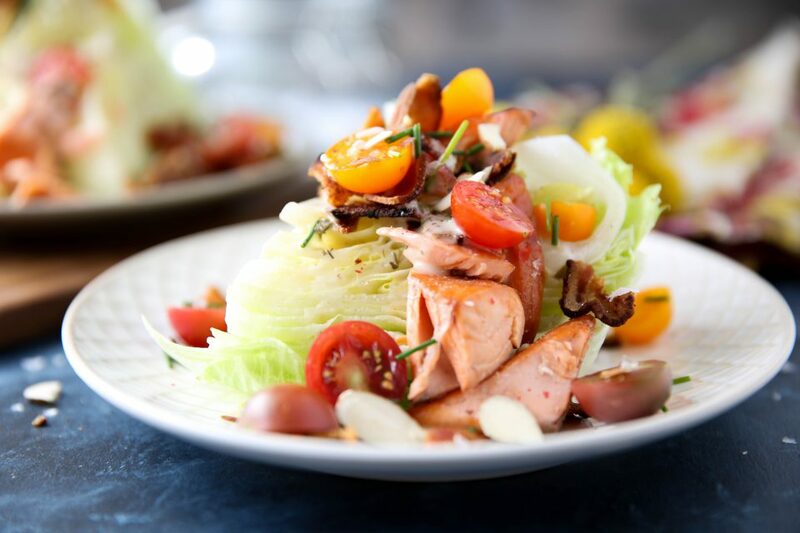 Place eat lettuce wedge on a plate. Once the salmon is done cooking, use a fork to break apart that salmon into pieces. 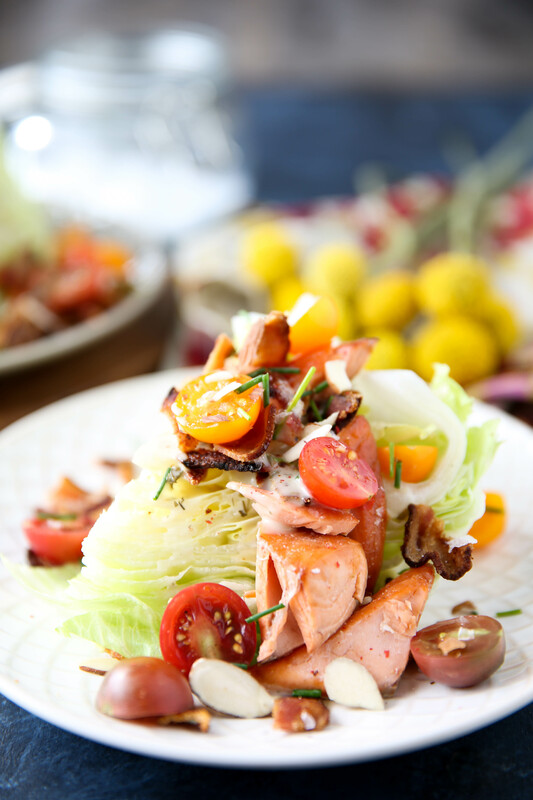 Spoon ranch over each wedge, then add salmon, bacon, cherry tomatoes, chives, sliced almonds and garnish with flaky salt and black pepper on top of each! HAHA! I have found as I have gotten older (Im 33) I can’t tolerate certain shows anymore, including the Kardashians! It just irritates me instead of helping me to relax. I am not a person that upgrades my phone ever! I wait until it dies. I think I still have a 4S. People make fun of me all the time but dropping $1K on a phone isn’t something I’m going to line up to do! Have a great day Juli! the iPhone 8 looks amazing but I stay a little behind the times, I just got the 7 and love it. I’ll probably upgrade to the 8 when they come out with a new one again, because they seem to drop the price a bit. But if you’re going to upgrade I’d say get exactly what you want, especially since like me you get your money’s worth out of your phone! Hi Juli! 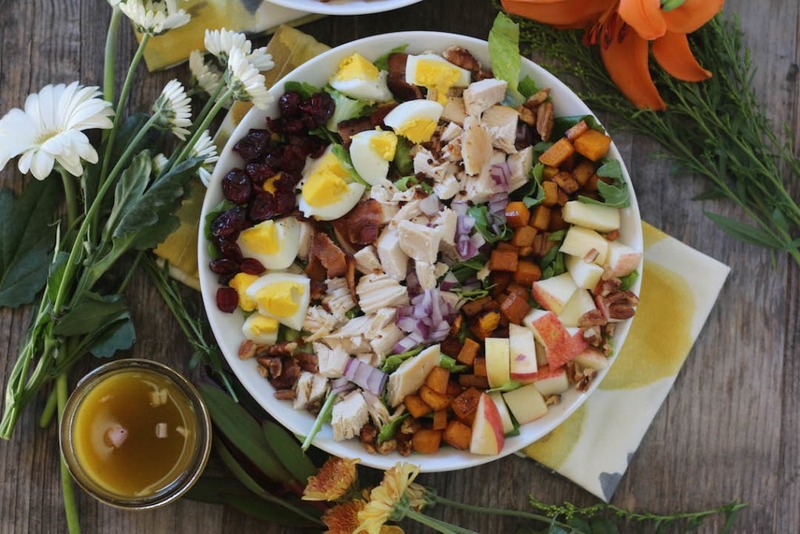 Thank you for the recipe- its unusually hot over here on the east coast so all I want is a good salad. Do you not use oil or fat to coat the salmon before broiling it? And get ready to start feeling old a lot more often, I’m 31 and after turning 30 that thought enters my head a lot more haha. And then people will be like OMG you aren’t old at all, and I know that but it’s just the way you feel sometimes, you know? I can’t wait to try this, thanks! 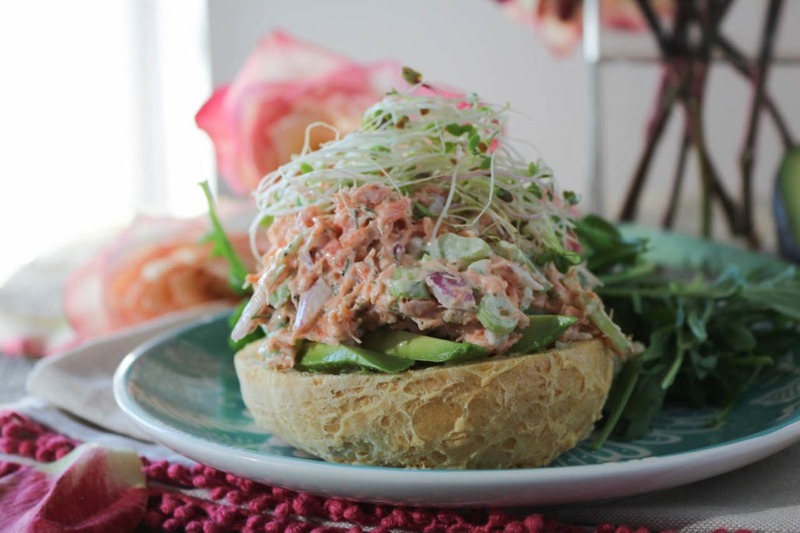 I just tied this recipe for dinner tonight and it was AMAZING! I have never broiled salmon before, but it was the easiest and most delicious thing I have eaten! I added cucumbers and green peppers for some extra crunch. This was so simple and quick! I will definitely be making this again. If you are nervous about cooking fish, this is a great way to try and it and be successful. yayyyy!!! so glad you liked it!